A great book exploring the majesty and mystery, facts and fantasy of the quirkiest kingdom of life on earth. Bang up-to-date, this new edition incorporates recent taxonomic name changes resulting from recent DNA analysis, together with previously common synonyms and the British Mycological Society's recommended English names of fungi species. A great book exploring the majesty and mystery, facts and fantasy of the quirkiest kingdom of life on earth. For millennia the mysterious nature of fungi has intrigued the intrepid. Fungal fruits of field and forest have fed the fearless, while the (surprisingly few) resulting fatalities have fuelled myths and legends. Monks and murderers have turned mushrooms to their advantage; artists and authors have fallen for the fascination of fungi. Once enticed in to this quirky kingdom, the magical mix of majesty and mystery has enough power to captivate the interest for a lifetime. But the complexity and scientific jargon of the subject made it difficult for newcomers to gain a broad view of this vast topic... Problem solved! Fascinated by Fungi is an easy-to-follow introduction to a complex and largely unexplored kingdom of life and the history, mystery, facts and fiction born out of the fascinating foibles of mushrooms, toadstools and other fungi. In the UK since its launch in September 2011 this has jumped to the top of the bestseller lists for non-specialist books about fungi, with tremendous acclaim in book reviews. "If you buy only one book about fungi, this should be it"
"...this is a tour de force, a tremendous achievement in bringing this extraordinary kingdom to life... With its originality, freshness of approach and liveliness of text, I would like to think that Fascinated by Fungi will become a classic text, introducing a new generation to the wonders of fungi.". James Robertson, review in Natur Cymru, Winter 2011-12. 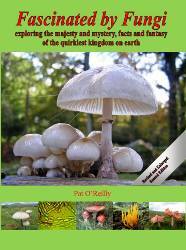 Pat O’Reilly’s fascination with mushrooms and other fungi stretches back more than 40 years and has taken him to many countries; but, as he says, there is a special satisfaction in finding and identifying beautiful fungi close to home. Writing and broadcasting on wildlife and countryside topics for more than 30 years, Pat is the author of more than 20 books and hundreds of articles. With his wife Sue he produced and maintains the First Nature website, which receives up to a million visits a year and hundreds of enquiries via an extensive Fungi section. Pat, an active conservationist, has chaired and served on several advisory committees and special commissions. He served as a member of the Council of CCW (the Countryside Council for Wales), where his specialismst were fungi conservation (he is a Member of the British Mycological Society) and the management of National Nature Reserves in Wales.